A climbing ranger at Mount Rainier National Park has died during a rescue attempt on the Emmons Glacier this afternoon. Ranger Nick Hall, 34, fell from the 13,700 foot level to about 10,000 feet on the mountain's northeast side as he was helping to prepare other climbers for extrication by helicopter. At approximately 1:45 p.m. this afternoon, Thursday, June 21, 2012, a party of four climbers from Waco, Texas, fell at the 13,700 foot level of the Emmons Glacier as they were returning from a successful summit attempt on Mount Rainier. Two members of the party slid into a crevasse. A third member of the group was able to call for help using a cell phone. During the subsequent rescue, at 4:59 p.m., as the first of the climbers was being evacuated by helicopter, Mount Rainier climbing ranger Nick Hall fell, sliding more than 3,000 feet down the side of the mountain. He did not respond to attempts to contact him and was not moving. High winds and a rapidly lowering cloud ceiling made rescue efforts extremely difficult, but with the help of Chinook helicopters from Joint Base Lewis-McChord, three members of the original climbing party were lifted off the mountain by about 9:00 p.m. and taken to Madigan Hospital. The remaining member of the party is spending the night on the mountain with climbing rangers from Mount Rainier National Park, and rescue options will be reassessed in the morning. All four suffered non-life threatening injuries. The last of four Texas climbers rescued on Mount Rainier in an effort that cost a ranger his life walked down off the Washington peak Friday while blizzard conditions high on the mountain delayed efforts to retrieve the body. The final climber, Stacy Wren, descended the mountain with Mount Rainier National Park rangers and was whisked away by car Friday evening. Three other climbers were plucked off the mountain by helicopter Thursday after the group fell and two of them ended up in a crevasse. 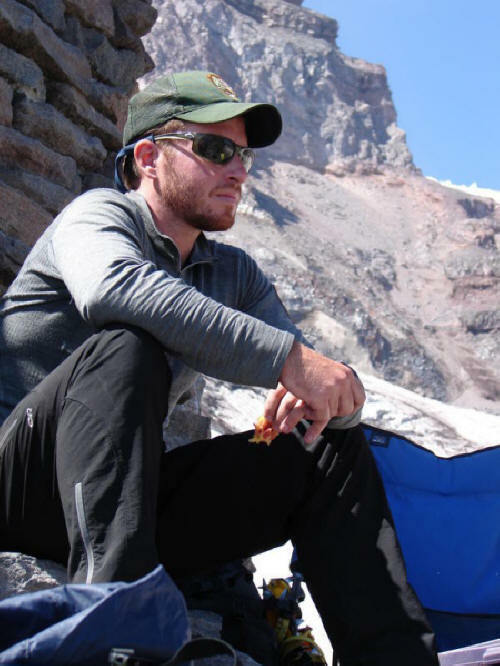 Eight other rangers trying to retrieve the body of climbing ranger Nick Hall, 33, from the 11,200-foot level of the 14,411-foot mountain were pinned down in a ground blizzard. They planned to spend the night at Camp Schurman at the 9,500-foot level and hope for a weather window on Saturday, park spokeswoman Fawn Bauer said. Hall slid more than 2,600 feet to his death as he was helping evacuate the Texas climbers. Hall, a four-year veteran of the park's climbing program, came from a family of EMTs who aided soldiers in Iraq and car crash victims in his small hometown of Patten, Maine. He was not married and had no children. A Chinook helicopter from Joint Base Lewis-McChord removed three of the four climbers and rangers stayed on the mountain Thursday night with Wren. The climbers from Waco, Texas, had reached the summit and were on their way down, roped together, when two women fell into a crevasse on Emmons Glacier. Two men were able to stop the group, and one called for help by cellphone. Hall had helped put three climbers into the helicopter when he fell. The park is investigating exactly how he fell, Bacher said. "We don't want what happened to Nick to happen again," he said. "There's no urgency today; nobody's life is at risk today. Let's take it slow and make sure nobody else is hurt." "We're a very small team and particularly the climbing team — basically 15 people under the climbing foreman," said Bacher, who also is a ranger. "And they work very close together and train close together and depend on each other for their lives and become very close." Hall's family said they were proud of his involvement in mountain rescues, and hoped that his death will draw attention to the profession's dangers. Hall's father is a volunteer firefighter and EMT in Patten, and his older brother, Aaron, served in the National Guard as an EMT in Iraq. Aaron Hall celebrated his birthday on the day his brother died on the mountain. Nick Hall had worked as an avalanche forecaster at Yellowstone National Park and as an emergency medical responder for the ski patrol at Washington's Stevens Pass Ski Area, his father said. Hall was the second Mount Rainier National Park ranger to die this year. Margaret Anderson was fatally shot on New Year's Day as she tried to stop a suspect in a Seattle shooting who drove through a tire-chain checkpoint. Benjamin Colton Barnes, 24, was found dead the next day in the snow. Rescuers are still looking for four other people — two climbers and two campers — who disappeared on the mountain in January. "We're keeping our eyes out for them as the snow melts out," Bacher said. Recovery efforts for Mount Rainier National Park Climbing Ranger Nick Hall continue today, Sunday, June 24, 2012. Hall, 33, fell approximately 2,500 feet down the Emmons Glacier on Mount Rainier on Thursday, June 21, during a rescue attempt in which four climbers fell into a crevasse on the glacier. Hall did not respond to attempts to contact him and was not moving after the fall. Climbing Rangers assisting in the rescue of the four climbers were able to reach Hall, several hours after he fell, and upon arrival found that he was deceased. Rescue efforts for the four climbers continued throughout daylight hours and into the next day. All four climbers were successfully rescued and transported to a hospital. Injuries sustained by some members of the climbing party remain serious. Mount Rainier National Park has experienced several days of inclement weather that has slowed efforts to recover Hall’s remains. Heavy cloud cover, in conjunction with several feet of new snow, has made attempts to reach Hall’s location extremely difficult. Additional amounts of snow are forecast today as well; however the park is expecting a small weather window that may be utilized to reach Hall’s body. Access to the Sunrise Road continues to be restricted as it provides the safest access for an aerial recovery of Hall’s remains. Mount Rainier National Park Rangers, local search and rescue team members, a Chinook helicopter with crew from Joint Base Lewis McChord and an MD500 helicopter from Northwest Helicopters out of Olympia, Washington continue to assist in the attempted recovery of Hall’s remains and to assure the safety of other climbers on Mt. Rainer. --From a USFS email message. Please make checks payable to Nick Hall Memorial Fund. Donations to this fund will support search and rescue in Maine and assist the Hall Family with travel expenses. Please make checks payable to DOI-NPS and note that the donation is in honor of Nick Hall. After two weeks of delays due to weather and avalanche danger, the body of a Mount Rainier National Park ranger who fell to his death during a rescue operation was recovered Thursday by helicopter. The body of Nick Hall was flown to the Sunrise ranger station to be driven to the Pierce County medical examiner's office in Tacoma, park spokeswoman Patti Wold said. The recovery went smoothly in clear weather, Wold said. Snow, clouds and avalanche danger prevented the recovery in the days after the June 21 accident. Officials didn't want to unnecessarily risk the loss of another life in a recovery attempt in dangerous conditions. A dog accompanied six rangers in an Army Chinook helicopter from Joint Base Lewis-McChord to help them find the body, which was covered with snow, Wold said. Rangers who found Hall dead the day of his fall had already put the body on a litter. When it couldn't be removed, it was anchored while everyone waited for clear skies to return to the coordinates on the Winthrop glacier, on the 11,300-foot level of the mountain. While the weather was good, rangers also planned to use the helicopter Thursday to recover gear left during the initial rescue. What can climbers learn from this tragic accident? Possible existing technical mountaineering mitigations of the inherent risks of loading injured climbers into a hovering helicopter on a steep hard snow slope may be detailed in the expected Investigative Report from the National Park Service. We will try to bring the Report to you here, in due course. The value of TraditionalMountaineering to our Readers is the selectivity of the information we provide, and its relevance to introducing folks to informed hiking on the trail, exploring off the trail, mountain travel and Leave-no-Trace light-weight bivy and backpacking, technical travel over steep snow, rock and ice, technical glacier travel and a little technical rock climbing on the way to the summit. Whatever your capabilities and interests, there is a place for everyone in traditional alpine mountaineering.